We left from Nashville around 9 am. We arrived in Memphis around 1 something p.m.. We decided to check out the mall when we got there. We all three looked like crap from traveling 4 hours and I was just anxious in changing clothes and freshening up. When we entered the mall we didn't see no one nor did we hear much so we are thinking "ok so doesn't Hanson have that many fans anymore". But as we neared the area where they were suppose to be at we started to hear a few yells and screams. And we when got there, there was a ton of people! And the line to get autographs was really long! So we decided to find a hotel, which was the Wilson World Hotel, right beside of the mall which I recommend to anyone who is staying in Memphis. It's not too flashy on the outside but the inside is really cool. But anyway it probably took us a matter of 30 minutes combined between the three of us to get ready. So we went back over to the mall at which this time I was starting to feel quite excited not to mention nauseous. Now we are at the point at trying to figure out whether or not to stand in line to get autographs or wait around so we can get in front when they do their interview. And also at this point I don't know whether they are performing or not because by now I have heard about 3 different things. So we ditch the autograph scene and are in the front of an ever growing crowd that is forming just past the escalators. My second older sister, Melissa, 19, and I, Kristin, 16 are waiting ever so patiently on the floor while my oldest sister, Marsha, 29 is video taping things from the balcony of the second level just behind us. So after waiting since about 2 something that evening around 5:45 p.m. Hanson enters the stage and over to the table to sign autographs. I yell some but I mostly just cover my ears and watch Hanson walk past before my eyes. On a personal note I am not a big screamer anymore. And after almost 2 years away from large crowds of Hanson fans, my ears are not use to earth shattering screams like before. So this marks the 2 hour wait for Hanson to sign everyone's autograph and make their way to the stage. Now at this point the fans have been told that Hanson will not perform. You guys would not believe how upset I was. Because to me, it's all about the performing. And I just knew if they did do some songs that they would do their usual acoustic set. So about twice I had sat myself in the floor waiting and waiting and waiting. So finally I get a hard and somewhat frantic nudge from Melissa. Telling me to get up and get ready to run so we can make it in the front. 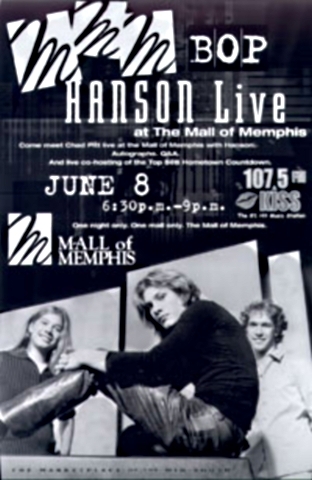 And we are informed at this time that, yes folks, Hanson will be performing a few songs. And despite that whole "I'm not a big screamer" I screamed my lungs out, accompanied by a few giddy jump up and downs. I was so happy! Despite the security guards moving the barricade a few yards back from the stage I was still very happy. Melissa and I made it to the front, yay! And before my very own little eyes and just a few yards away Hanson themselves glide by onto the stage. When they finally got situated, Isaac running off for about 2 minutes then coming back and whispering to Taylor very seriously, and Taylor starting to ramble when Isaac finally cut him off by saying "Ok we have a few songs to perform" lol They performed "Sure About It" which is my song! and "If Only" which is Melissa's song! And I will say that they were so freaking' awesome! I didn't really sing along or clap I just stood there and swayed a bit because I just have to do that when I'm listening to Hanson's music. Just stand or sit there and take it all in. After they performed, while everyone was giving the I love you hand signs I gave my rock on sign, most times referred to as the heavy metal sign or the devil sign. Their performance rocked so hard that they deserved it. They sat down for an interview. But before they got started Zac did this little dance with his chair which I think he was making fun of the Backstreet Boys. I'm not 100% sure but I'd say I'm about 98.9% sure about it. And the ever so goofy Isaac did the Charleston dance. Which was incredibly funny! They did their little interview which I couldn't hear most of it because like in most cases when there is a rather large crowd of Hanson fans there is always the ever presence of murmurs, yells, screams, laughter and so forth. So I just kind of ditched the listening part and decided if I could get one of their attentions by waving. And in about the middle of it I was waving that kind of hard really quick wave you do to get someone's attention. And Zac looks at me and waves really hard, making fun of me. So I just made a face at him and waved even harder and that just made Zac smile and laugh a bit. I was quite happy at that. Even though he made fun of me it was still all good. So around 7:30pm they finished up, sang us a capella of the chorus of This Time Around and left. I was just elated. Melissa was quite teary eyed. We hurried up the escalators very giddy over to Marsha. And now we are at yet another point. Trying to find where Hanson comes out at. So after a minute of calculations we take off in to a direction that we wasn't even sure why we was going in this direction it just seemed to make sense. So we round a corner or two and climb up this little hill and up ahead I see a white van with around 10 fans standing up around it so instinct sets in and I start running with my two sisters in tow. I get up there and I see no Hanson so I'm just waiting there. I'm probably the one that's farthest away from the van I'm just kind of hanging out by myself for a few. Just as I shrugged my shoulders at my sisters I see a dude peek out of one of the doors, which is a back entrance to the mall. And then I hear "Ok people stand back give them room". Ok, so at this point I'm in shock because I just did not think Hanson would just be right there, with no barricades or tons of security, with nothing but thin air holding the fans back. At my first glimpse of Isaac I remembered my letter that I had written them which was stashed in my purse. I had spent months on this letter and three hours the previous night writing it out. I had to take my time and write decent because when I just write something out it looks like chicken scratch. So I have my letter in my hand and I yell at Ike and he ignores me. Then Taylor goes by, I yell, and he ignores me. Oh well. But then Zac is walking by, note: I LOVE Zac. He is just such an awesome guy, I have loved him since he was 12. I just think he is one of the coolest 14 year olds ever. But anyway I find myself yelling "Zac" and holding out my letter to him. He stops and I ask "Zac, will you take this?". He takes the letter and while he is looking at it he says "Well thank you" NOTE: This is probably the most sincerest thank you I have ever received before in my life! He smiled really big and looked up at me still smiling and walks off still holding my letter. I'm standing there in shock and I keep feeling someone poke me rather frantically in my shoulder. It's my sister Marsha who keeps saying over and over "I touched him, I touched Taylor!" NOTE: Yes my sister is 29 and yes Taylor is 17 and my Marsha is absolutely in LOVE with Taylor. I can't blame her. Even if I was like 50 years old I would be in love with these guys. Not only are they so talented and very passionate about their music but these boys are beautiful. In pictures and on t.v. they are quite lovely but in person they are absolutely breath taking! So anyway then I remembered that I didn't even get to touch any of them. Zac was just about to get in to the van when I yelled his name and I stuck out my hand. He half turns around and grabs my hand. NOTE: His hands are big and really rough! hehe And after giving a few quick half high fives half slaps to about 2 more fans he gets in the van. I'm just standing there switching back and forth between the I love you hand sign to the rock on hand sign. And yes after they were out of view I started to freak out! I just sobbed I was so happy. At one point I very numbly fell to my knees and just wept. That was probably one of the happiest days of my life! Not only did I get to hear an acoustic performance of my favorite song but I got to give Hanson my letter which I know they will read. My letter which tells them how much their music means to me and how much they have inspired me. And of all Hanson's I give it to Zac, who I just adore, and have him smile and speak to me. Yes my friends it's the simple things that make me the most happy! But I left Memphis being a very happy camper! I found this picture on the 107.5KIIS Fm website. It's a shot of the crowd which has me and Melissa in the front. I really dislike this picture of me but I hate every picture of me. And you can see Marsha on the balcony, barely but you can make her out. I've circled us as you will notice.